If small scratches remain on the workpiece surface after it is finished with lapping, polishing is applied to remove these scratches and mirror-finish the surface. Polishing is performed by using a polishing cloth selected from a variety of cloth types. 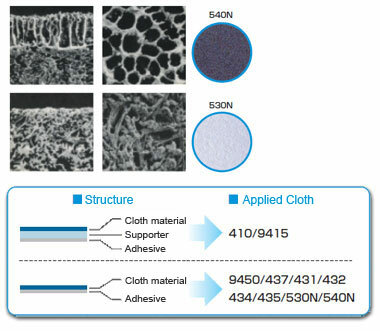 There are three kinds of polishing cloth materials, as shown in the following SEM photographs (1) through (3); the features and specifications of each cloth type are shown below. 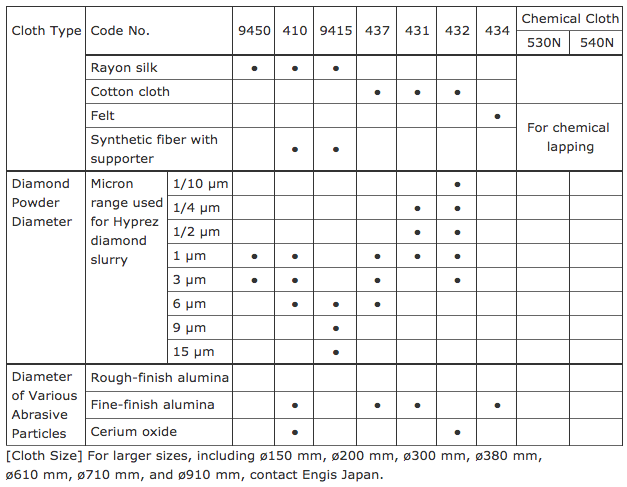 Be sure to select the cloth that is optimum for the workpiece material and polishing conditions. The back side of each cloth is coated with adhesive to allow easy mounting of the cloth on a polishing cloth plate.